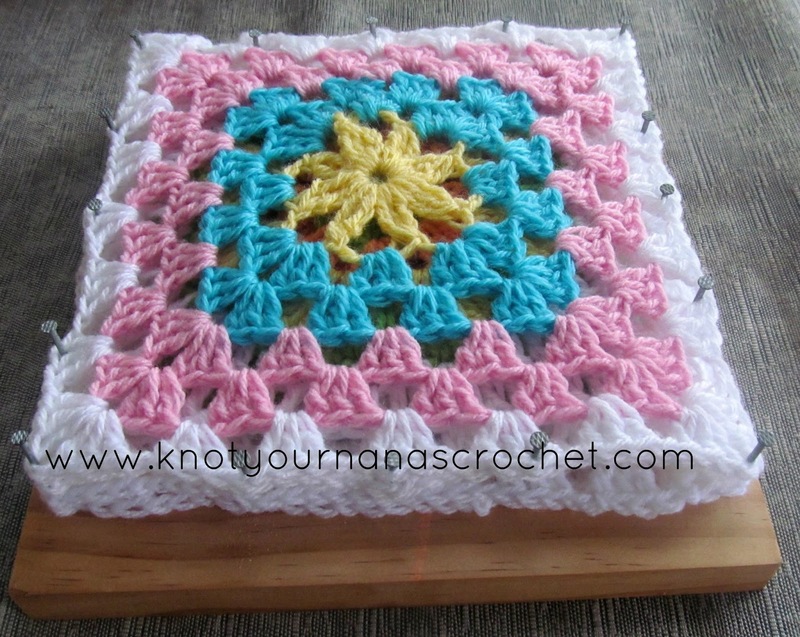 I thought I would give you an idea of how I block my acrylic granny squares. I did a bit of research on how to block acrylic squares and most of the answers I found said you can't or just to place a wet cloth over them or spray them with a bit of cold water. This method seems to be working for me. It sort of stretches them to exactly 8 inches and after a week they tend to stay the same shape they have been placed in. NOTE: if you decide to combine my method with the wet cloth/cold water spray method make sure you use rust proof nails. Rust stains on your pretty granny squares would not look very nice. A block of wood slightly bigger than the squares you wish to block. Mine is just over 8 inches. 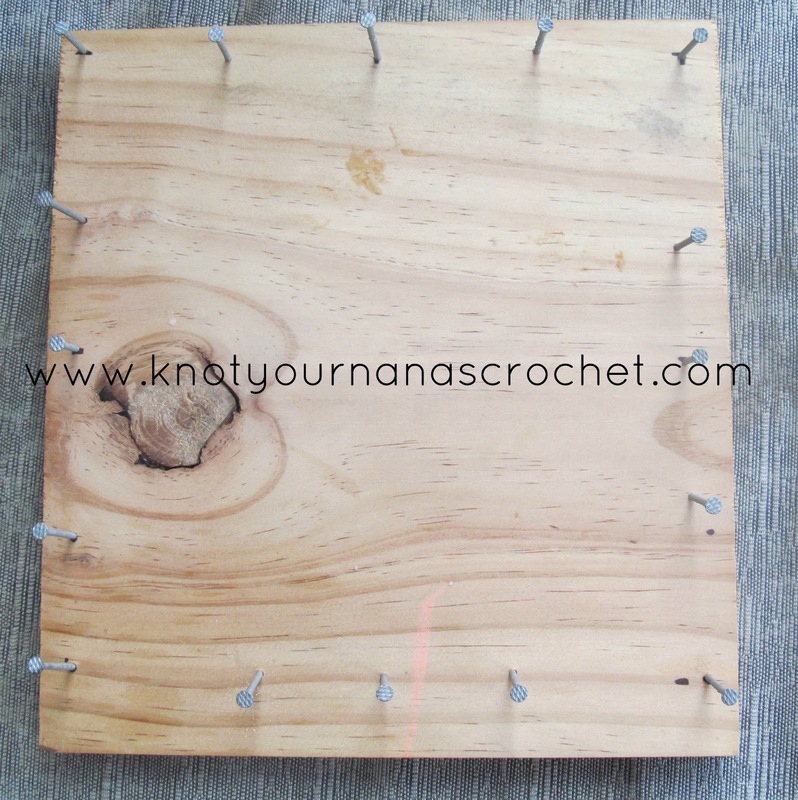 Step 1: Measure out a 8 inch square (or the size of your granny 6", 12" etc) in your block of wood. Mark each corner. Step 2: Place a nail in each corner. Now you will notice I have left the heads of my nails up. I have kids so this is a safer option for me although it does make it a pain to get the granny squares on and off. If you would prefer you can hammer your nails right the way through to make it easier and have the pointy end sticking out the block of wood. Step 3: Evenly place nails in between your corners. I used 3 in between but you may need more or less depending on the size you are blocking. Step 4: Place your granny square over the nails and leave for a week. I leave my 3 squares from the Granny Square CAL until I have to make room for the next weeks squares. I think I will try this method. I usually use a padded quilting board but can only block six at a time. It wouldnever have occured to me to block, blocks lol thanks! Tee heee! I am doing the same with my squares and also posted about it. Cheers! My husband took one look at this and said to use finishing nails! No nail heads OR sharp points!